Anthropologist Kirstin C. Erickson examines the ways in which Yaqui women’s social and sacred use of the home space is “integral to Yaquiness,” the sense of ethnic identity and connection with the past. 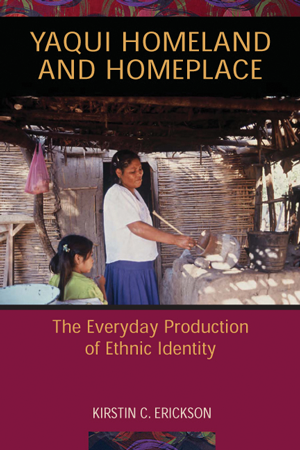 Erickson conducted ethnographic research in several Yaqui pueblos, including living with a Yaqui family. She made contacts with their extended families, circles of friends and ritual kin. She participated in the daily lives of women. First, Erickson presents an overview of Yaqui history and the importance of place to their identity. In conveying what it is to be Yaqui, interviewees emphasized the endurance of their people during exile and slavery. Erickson heard many stories of hardship and their struggle to return to their homeland. Next, Erickson discovered that she could not separate gender from place and ethnicity. Yaqui women described themselves first as Yaquis. For example, in their birthing stories, Yaqui women emphasized an ability to endure pain that they believe distinguishes them from non-Yaqui women. As a people, the Yaqui have endured for more than 500 years, and the women Erickson met felt an obligation to themselves and to their people to maintain this identity.